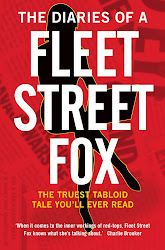 fleet street fox: Recall (vb. ): To summon back to awareness. They don't much care if you know it, because you're so stupid it doesn't matter. So what if you can see they're wiggling their fingers in their ears and sticking their tongue out while they say 'NA NA NA NAAA NAH'? You're too dumb to matter. What matters is that the people who think they're clever get to be in charge. They want to own the whole playground, charge entry, be the winners of every game of British Bulldog, take your dinner money and intimidate their victims into staying the hell out of their way. That, presumably, is the sort of attitude you need to be a successful Member of Parliament or life Peer. A conscience or vocation in the Houses of Parliament only holds you back, sees you consigned to the backbenches, mocked like Dennis Skinner and left to watch as your backsliding, avaricious, amoral contemporaries play the property market and get elevated to the House of Lords for faithful service to the boss. Politics is a corrupt business; it always has been, and successive attempts to clean it up have merely forced corruption to evolve. The Great Reform Act got rid of rotten boroughs, but these days only a handful of constituencies are likely to make a difference in a general election. Universal suffrage gave women, the poor, and the young a right to vote and be represented, yet few such have a seat in the House of Commons. Constituency boundary changes are little more than shuffling a stacked deck so it is still stacked. Politicians' efforts to clean their own gutters have historically been so lame and pointless that when they're called to account they've ceased to do little more than pretend to wave around a metaphorical feather duster. So with the revelation that one MP and three peers were caught on camera seemingly selling Parliamentary influence for up to £12,000 a month it is hardly a surprise that the Government's main response is merely an offer to write it all down. A register of lobbying interests is nothing more than an expensive, bureaucratic way of obfuscating the point - one which, as Francis Maude admitted yesterday, would merely make it more difficult for journalists to carry out such a sting rather than convince politicians to behave themselves. The problem is not that there are lobbying firms employed by pressure groups to press home their argument, which is allowed; the problem is that it's already against the rules for politics to be paid by outside interests and all four were caught on camera with their hand out. It doesn't matter they thought they were taking money from an undemocratic military regime thrown out of the Commonwealth. It wouldn't matter if it was elderly nuns offering them cash to speak up for abandoned kittens. The rules say you don't take money, and that's that. The fact several of the politicians smelled a rat and later reported the bogus lobby company, that money did not in the end change hands and they managed to stay within the rules, is neither here nor there. They asked for money, they intended to circumvent the rules, and if it had been a genuine offer they'd not have reported it to a soul. They're already made to declare some interests, and as the sting revealed they set up tag-team deals with other corrupt politicians to ask questions and host functions for one another so they can get around it. But wait! There's a second moral feather duster being held aloft by the worthy Nicholas Clegg, and it is the power for the public to recall disgraced MPs. He first mentioned this in 2008, as the expenses scandal began to boil. He wanted voters to force a by-election once their MP had been suspended by the house. It was mentioned again in the 2010 Coalition agreement, only now voters were to have the right of recall merely in the event of 'serious wrongdoing', which had it become law would have led to half of Parliament being out on its arse. In 2011 Clegg raised it again, but no doubt worried how many MPs could be accused of misbehaviour watered it down to being only in the event of a criminal conviction. A month later he told a committee it would merely be a 'backstop' and would not for example be used by voters whose MP didn't bother to do any work. Which is odd, because that's the sort of thing every other public sector employee gets sacked for. In 2012 that same committee of turkeys announced they would not be voting for Christmas, as voters already had the chance to remove MPs at election time and no further sanction was necessary. And today, faced with a corruption scandal, Cleggy has been wheeled out once more like Mrs Mop to promise "it is happening" and the power of recall will be introduced before the next election. I look forward to it. 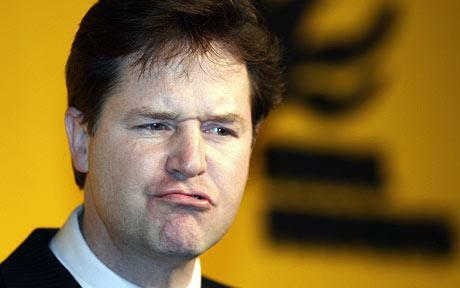 I can't wait until Nick Clegg can recall what a lying shyster we all think he is and wind his neck in. Until then Clegg, Cameron et al will carry on telling themselves we're too dumb to remember they've promised all this before, that they don't keep their promises, they write their own rules and hold each other to the merest forms of account. Even if the recall proposals were introduced, they wouldn't have stopped this scandal - you can't force a by-election for peers who aren't elected in the first place. There is no right to sue an MP; no annual personnel review; no system of formal warnings and the sack as there is in every other job on Earth. The external scrutiny comes courtesy of journalists alone, and while we can heap up disgrace they do not have to lose their job if they or their leader don't fancy it and, just for good measure, they can legislate against us too. The simple truth is there is no need for registers of interests, financial, lobbying or otherwise. There is no need for rules about how many shares you can own or how many hours a week a politician ought to work. MPs and Lords are paid for by the public. If they want to be paid by someone else, they should get different job. MPs are paid a basic starting salary of £65,738. That's more than £5,000 a month before tax, which for most of us would be quite enough to pay into a pension, pay the family mortgage and rent a one-bedroomed flat in London. That salary puts them in the top three per cent of earners in the UK - there's no need for pay rises, second home expenses, subsidised booze or supplementary earnings, whatever they bleat about being paid peanuts. Peers get £300 a day just for turning up and signing on, with no requirement to vote, speak or do anything they don't want to. It's a bit like being on the dole, if the dole didn't involve jumping through hoops in for £70 a week. Politicians should work the same hours everyone else has to, they should get the same holiday everyone else does, and they should face exactly the same prospects of losing their job as anyone else who messes up or breaks the rules. It's not difficult. It doesn't take five years of Nick Clegg changing his mind. It probably needs someone who's not actually a politician to get elected with enough clout to enforce it, but it's really terribly simple because we've been cutting benefits for three years and the pigs with their snouts in the Westminster trough are about due a dose of reality if you ask me. 1. Politicians are servants, not masters. If we don't insist on it at every election, every radio phone-in, every husting and every public meeting, then we've only ourselves to blame.